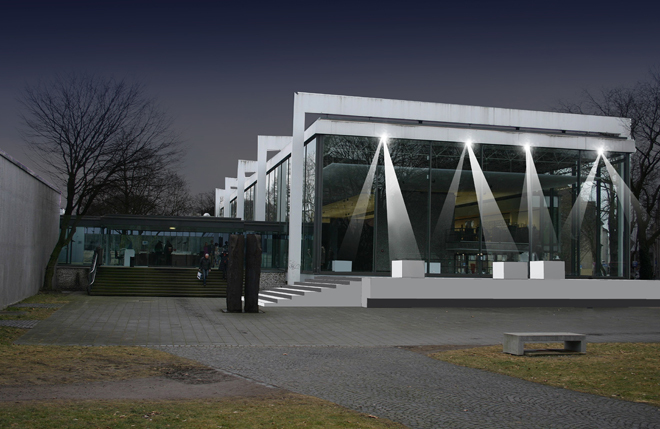 The Lehmbruck Museum is distinguished by its exceptional collection of international modern sculpture that is housed in an important architectural example from the postwar period. The project is created as an interactive platform in dialogue with exhibits from the museum’s collection. On the terrace before the glass front of the exhibition space the visitors can become living sculptures and bring to mind such performative concepts of the sixties, like the works by Piero Manzoni or Gilbert & George. Three to four plinths invite one to position oneself, analogous to the selected works in the interior, in front of the glass pane that is supposedly a mirror axis. Sensor-controlled spotlights track and highlight the moment of the movement and the exposure. The boundaries of institutional and public space, of reception and participation become blurred. A new experience in the encounter with art is made possible.